We are Breeder’s of Dubia Roaches In Murrieta, California. 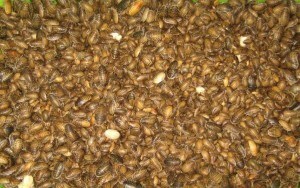 Our Roaches are fed almost completely organic food. We monitor there habitat with state of the art equipment, temperature and Humidity are electronically monitored and email alerts are sent out if some thing is not within their comfort zone. Each Container is monitored individually, temperature and Humidity are stored at 30 minute intervals for five years. This helps us identify problems like when the roaches have deformed wings during moulting. This also helps identify low breading in some bins that do not have normal temperature and humidity levels.